I always love the color and feel of her work. This one captures the minutes that slip away when a child is lost in the magic of illustration and word. To me, it’s what a mother sees when she hovers over her child and chooses not to interrupt.Stephanie Hock is an artist, devoted mother of four, including twin girls, and somehow (to my amazement) makes time to paint despite her busy household. Her work, like her life, is cheerful, colorful, and full of happy energy. See more of her art here. Originals and prints available for purchase. So! A pile of books. That’s what I have for you today. 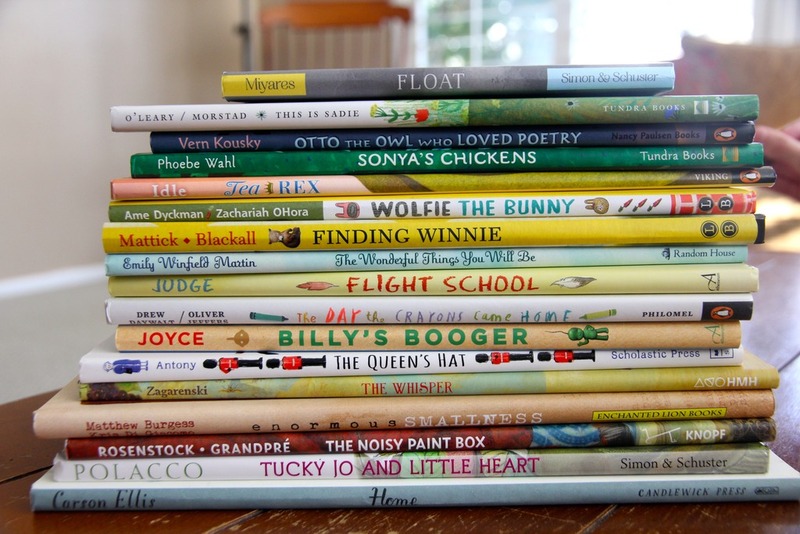 20 favorite picture books (published in 2015) for you to explore. The magic of picture books is that they can be enjoyed by all ages. Goodness, I think I love picture books more now than I did as a child. I intended this post to go up in January. But that was the month I had pneumonia and pleurisy, and we moved, and well… all kinds of good aspirations didn’t materialize. These are the last photos I took in the old home. Can’t look at them without sighing. How brief these years are! Eliza is past my shoulders now. Sami and Ali are so mature I don’t have to monitor their piano practice. Spencer and Gordon rarely hold my hand. All of them are moving on to new things, new joys, all the time. So much living and growing happened inside those walls. 2015 was a banner year for children’s literature. If you haven’t discovered these yet, you will want to make sure they’re in your library queue or amazon cart. Our favorites are at the top of the list but every book made the list for good reason. We have a nice balance this year of fiction and nonfiction. In your summer reading, be sure to include picture books. They are so much fun and teach fabulous lessons. Even for big kids! 1. Finding Winnie by Lindsay Mattick and Sophie Blackall (2015). This incredible true story easily topped our list. It’s the story of Harry Colebourn, a veterinarian who adopted a baby bear in his travels with the Canadian army in 1914. He named her Winnie, after his hometown Winnipeg. This book tells their story, including the day Winnie made a new friend. A boy named Christopher Robin. This book has a beautiful surprise ending and is winner of the 2016 Caldecott Medal. Incredible illustrations, which you may find familiar. Blackall is the illustrator for the Ivy and Bean series. 2. Last Stop at Market Street by Matt de la Peña and Christian Robinson (2015). In a day when most American kids are growing up in neighborhoods with plenty of house, food, opportunity, and in many cases, entitlement, this book pries the door open to a different but very real world. An urban one with an important perspective. In this place, less is more and beauty can be found in simple things and all kinds of faces. The story is about a boy and his grandma, who ride the bus after church on Sunday, to serve food at a soup kitchen. It highlights topics of thankfulness, volunteerism, and contentment with what you have. I love the message of this read. Winner of the 2016 Newbery Medal and a Caldecott Honor Book. 3. Flight School by Lita Judge (2014). Hilarious. Clever. And so delightful. This one will make you smile again and again. It’s the story of a little penguin who is determined to fly. He has an irrepressible spirit and the soul of an eagle, even if he doesn’t have all the right parts and his body wasn’t built to soar. Little penguin teaches us about the power of dreams, optimism, and friendship. And these baby endpapers are my favorite. 6. Float by Daniel Miyares (2015). This wordless book is so imaginative. I love turning pages like this and letting my kids tell the story, compose a narrative based on observation, facial expression, and detail. Spencer used this book for a book report in his kindergarten class. The contrast of light and dark, yellow and gray is stunning, and tells the simple story of a boy who makes a newspaper boat with his Dad, then takes it out to the puddles for a rainy day adventure. One adventure leads to another. With Dad at the end to make everything alright. Endpapers include instructions for making your own paper boat. 7. Tucky Jo and Little Heart by Patricia Polacco (2015). This story has become one of my girls’ favorites. It’s a true story about kindness in difficult circumstances. Johnnie Wallen was known as the “Kentucky Kid” who enrolled at a very young age (15) in WWII. Assigned to the Pacific Theatre, Johnnie finds himself in New Guinea and then the Philippines, with people speaking a language he doesn’t know, battling for over 200 days straight. There he is helped by a small village girl who soothes his bug bites with a leaf only the locals know. He, in turn, shares his rations with the girl and her family. She calls him “Tucky Jo” and he calls her “Little Heart.” A strong and beautiful friendship forms. But it isn’t until years later he realizes the tremendous influence he had on this young girls’ life. Touching and heart-warming, this book about friendship and loyalty is a must read. 8. The Queen’s Hat by Steve Antony (2014). This book introduces kids to the most famous landmarks in London. The story is about the Queen setting off to visit someone very special when her favorite hat is whisked away by the wind. The Queen, and all the Queen’s men, chase after it. Into Trafalgar Square, The London Eye, Across the Tower Bridge, up Big Ben, until finally, it lands on that someone special’s head. The royal baby. There is a brief description of landmarks at the end. 9. Sonya’s Chickens by Phoebe Wahl (2015). This sweet story is about Sonya and three baby chicks. Sonya’s father gives her the chicks, and it is her job to care for them, feed them, grow them into hens. One night, however, she hears noises in the chicken coop and discovers one of her hens has disappeared. Sonya learns about the interconnectedness of nature, about one loss being another’s gain, that there is both joy and sorrow in caring for something. This book teaches important lessons about nature, farm-life, and family. 10. Home by Carson Ellis (2015). It might be an apartment in the city, a house in the country, or even a shoe. Ellis takes readers all over the world to discover the meaning of “home.” Whether it is on land, on the sea, in a mythical place, or even the artist’s own studio, this fabulous debut for Ellis is charming, instructive, and delightful. Ellis even paints herself into this book that helps children see the diversity and beauty of homes across the globe. 11. The Whisper by Pamela Zagarenski (2015). I love so much about this book. The power of story-telling, imagination, and owning or changing your own life story. The art is full of symbolism, depth, and detail. A little girl receives a curious book of stories from her teacher. While running home, the words slip out of the book, leaving only the pictures. At first the girl is disappointed. Until the hears a whisper, “Don’t be disappointed. You can imagine the words. You can imagine the stories… There are never any rules, rights, or wrongs in imagining – imagining just is.” And so she begins to create her own stories, full of magic and creativity. And in the end she meets a fox who, with her words, has found a way to change his own story. Sweet surprise in the endpapers. Zagarenski is a two-time Caldecott medal winner. Be sure to explore her other books. 12. The Day the Crayons Came Home by Drew Daywalt and Oliver Jeffers (2015). This clever sequel to The Day the Crayons Quit, has been anticipated by children and parents alike! In Daywalt’s first crayon book, Duncan has to deal with a bunch of gripey crayons who go on strike. This crew of crayons, however, have woeful tales and are looking for a way back to the crayon box. Like Maroon who was lost beneath the sofa cushions. And Turquoise, who ended up in the dryer. So funny and thoroughly enjoyable. Won best picture book award for 2015 by Goodreads. 13. This is Sadie by Sara O’Leary and Julie Morstad (2015). The little girl in this book reminded me of our Eliza. Girl with a big imagination. Always building things. Boats out of boxes. Castles out of cushions. She imagines herself in all kinds of places and stories. And… sometimes she cleans up her room by shoving her clothes under her bed. For Sadie, the world is full of magic and promises. Great book for sparking imagination and creativity. 19. Enormous Smallness by Matthew Burgess and Kris Di Giacomo (2015). This nonfiction picture book about E.E. Cummings is a witty, understated, and insightful glimpse into his poetic life. If you love Cummings, you will love the way this book captures his poetry, his mind, and the enormous smallness of his work. Cummings was known over time for using lowercase letters where capitals would normally sit, he used the lower case “i” often, and he had a way of celebrating the small things. Like birds, grasshoppers, a snowflake, and everyday pleasures. He also loved elephants while growing up and they became a known presence in his imaginative art, decor, and words. Burgess captures all of this so masterfully and simply. Cummings used the phrase “enormous smallness” when describing his relationship with nature. Thus, the title. I adore this book and the way it helps young readers come to know one of America’s most accessible poets. 14. Billy’s Booger by William Joyce (2015). Did you love The Mischievians? Or The Fantastic Flying Books of Mr. Morris Lessmore? Then you will also love William Joyce’s new book within a book: one of his first fictional stories. He wrote it in elementary school. It’s about the smartest booger in the world who stays tucked away until needed. To say, solve serious math problems or answer questions from the President. I know, kinda gross. But intriguing? Billy entered his book in a contest and was sure he’d win. Instead, he learned that being a winner doesn’t always mean you win. This funny glimpse into Joyce’s childhood will make you giggle. 15. Otto the Owl who Loved Poetry by Vern Kousky (2015). Otto loves words and how they sound together; he loves poetry. Keats, Rossetti, Dickinson, TS Eliot. He’d rather read than roost, recite than hunt. Which poses a bit of a problem. Because Otto is an owl. When the other owls make fun of him, Otto has to decide if he will stick with his passion or cave to predator pressure. Darling read with exposure to some of the great poets. A debut book by Kousky. 16. Wolfie the Bunny by Ame Dyckman and Zachariah O’Hora (2015). This clever and funny read is about a Bunny family who adopts a wolf. While the rest of the family is smitten, little Dot is the only one who seems to realize that Wolfie could eat them all up! Her new baby brother takes getting used to, and in a twist of fate, when Wolfie is threatened, it is Dot who saves the day. You may recognize O’Hara’s signature illustrations from No Fits, Nilson! 17. Maps by Aleksandra Mizielinski and Daniel Mizielinski (2013). If you’re looking for a fun map book for kids, this will make an awesome addition to your learning corner. The Mizielinskis’ lavish illustrations will draw kids right in. Along with cities, rivers, and peaks, you will find places of cultural or historical significance, eminent personalities, iconic animals and plants. 18. The Noisy Paint Box by Barb Rosenstock and Mary Grandpré (2014). This wonderful introduction to the art of Vasily Kandinsky, one of the world’s first abstract painters, is a fabulous insight into sound and color. Kandinsky was a proper boy growing up, but when he went to painting class, and everyone expected him to paint “properly,” he did nothing of the sort. He broke the norms and listened to the orchestras in his mind. He always heard sounds as colors, and considered colors as sounds. This exuberant take on creativity teaches us to hear art and… paint music! Kandinsky’s Color Study: Square with Concentric Circles. 20. Water is Water by Miranda Paul and Jason Chin (2015). Lastly, a science read. This lovely rhyming book follows a group of kids through all the phases of the water cycle. From rain to fog, snow to mist; they experience it all. Their innovative journey teaches kids about the wondrous way water converts, cycles, and gives life to the earth. Perfect for elementary kids studying the water cycle. Gordon just asked me why he’s wearing a sweatshirt in this picture. Well, hon… because I took it over six months ago! (It sure as hades isn’t sweatshirt weather now!) And it took me nearly a month to finish this post. Finally done! More summer posts coming. Can’t believe we’re already on the downside of summer! Hope your days are long and lovely, that you’ve had lots of time to read under a shade tree, or in the cool of evening on your own front porch. I love this list and I am so glad you included Tucky Jo and Little Heart. I too, found this book so beautiful. It touched my heart as I read it and asked my husband to read it as well. Patricia Polacco is a wonderful storyteller and I love that many of her stories are true! I just looked up the rest of Polacco's books. Oh my goodness. It's like an undiscovered jackpot for us! They are so lovely. And the stories! Do you have any favorites of hers you could steer us towards? Thank you for your comment! Thanks for the suggestions. Ethen needs a few more to round out his 20 books for the summer turn his trophy and these will be perfect! Many thanks for the wonderful list of books. When I was at BYU, I wanted to get a master's degree in Children's Literature, but there was no such degree (and I was told that they called it derisively "kiddie lit"!). I still enjoy it every bit as much as I ever have. Perhaps that is why I enjoy teaching preschool so much. Reading to children is such a delight! Can't wait to read your selections! No doubt you are such a wonderful teacher to those children. I'm intrigued… do you think BYU offers a degree in children's lit now? Unless I am mistaken, there are still just two Children's Literature classes at BYU, one an undergraduate course, and one a graduate course. I took both, the first was from the wonderful teacher Carma Sandberg. It may be that the U of U has the major, though.